JB Scott's Stuart Thomson with equipment at the company's North Geelong premises. 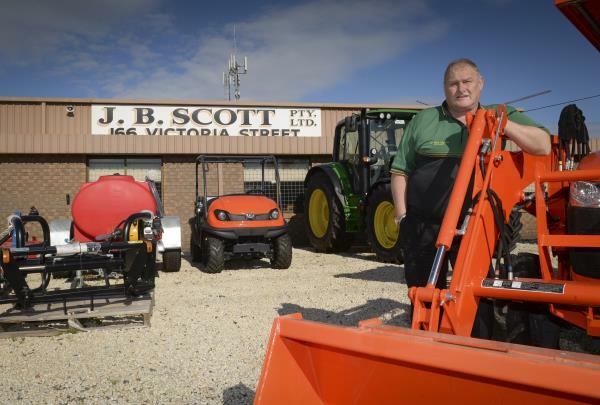 LONG-standing farm machinery dealership JB Scott has a wealth of experience to draw on for any small business needing a reliable partner. The 90-year-old business was founded in 1925 by Jack Bernard Scott and has now grown to become a multi-franchise company with dealerships in Lismore and Colac. Manager Andrew Cleary says the longevity means customers can be sure they are getting advice from someone who knows what they are talking about. “The continuity means you are talking to the same people and drawing on their years of experience,” Andrew says. JB Scott is an ideal place to spend the generous Federal Government $20,000 small business tax write-off. The dealership has a wide range of Kubota machinery and equipment, ideal for small business such as hobby farmers, lawn mowing contractors and tradies. Plus with JB Scott customers get first-class service back-up, fast and reliable spare parts service and on-site service and repairs. JB Scott also has a range of high-quality second-hand machinery. “We’re all local people helping local people. The fact we’ve been around for 90 years means you’re dealing with people you know and can trust,” Andrew says. JB Scott is at 166 Victoria St, North Geelong, phone 5277 9366.